POOLGUARD “SAFETY BUOY” ABOVE GROUND POOL ALARM, MODEL PGRM-SB is designed to be used in any Above Ground Pool including quick set, soft sided and portable above ground pools, as well as spas. Poolguard’s “Safety Buoy” alarm is the only floating alarm NSF Certified to the ASTM F2208 Pool Alarm Standard. 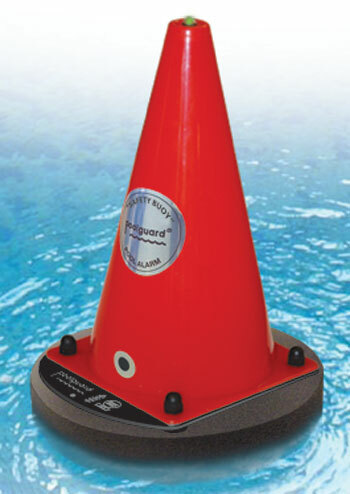 The “Safety Buoy” floats on the water and uses Sub Surface Detection Technology. The “Safety Buoy” comes with an In House Remote Receiver (200ft. Range), has a 1 year warranty, and is Made in the USA! The Poolguard “Safety Buoy” functions are controlled by the units Red Key. Silent Installation and Removal Feature: By using the Red Key, the “Safety Buoy” can be installed or removed from your pool without the alarm sounding. Tamper Proof: If the Red Key is not used, the “Safety Buoy” will sound an alarm if its removed from your pool. Constant Protection: Once the “Safety Buoy” is installed in your pool it is always on and cannot be turned off. Sleep Mode: The Poolguard “Safety Buoy” must be removed from your pool when you swim. Use the Red Key to enter Sleep Mode and place the “Safety Buoy” on its storage stand away from pool activity. The Poolguard “Safety Buoy” comes with an in house remote receiver that has a range up to 200 ft., and comes with a 12 volt power supply. Low Battery Function: The “Safety Buoy” system will beep once every 10 seconds when the 9 volt battery is low. The Poolguard “Safety Buoy” has been tested and certified by NSF International to the ASTM Standard Safety Specification for Residential Pool Alarms, ASTM F2208-08. Ideal for above ground pools, soft sided portable pools and spas. Poolguard “Safety Buoy” is designed to detect intrusions similar to a one year old child.